Now, Google Search Offers Full-Fledged Flight Search. 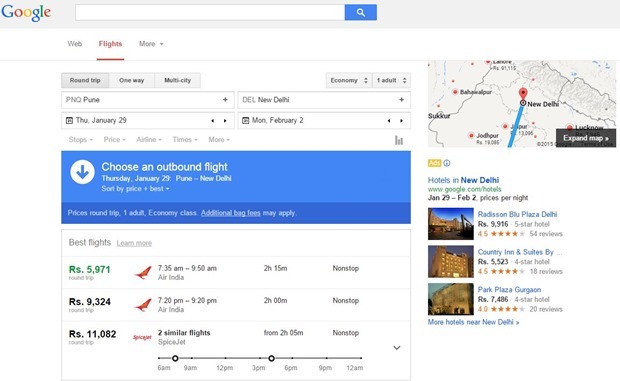 Google Search in India has now started offering addition information on their search engine – Flights search and booking. While Flight information was available on Google since 2013, it was very limited, a user had to enter the flight number and Google would display the destination, timings terminal etc. The new Google flight search feature is expanded to offer everything you will need to search and book a flight. Just enter the departure and destination cities and you will be able to see the flight details. Clicking upon it will take you to full-fledged micro-site that will help you quickly find, compare and book a flight on mobile, tablet or desktop! It is interesting to note that Google may also include sponsored listing into the information – that means they will be making money from the bookings that are referred directly from Google! When you search Flights on Google, you will get to see a calendar with the lowest fares for the route highlighted for each day. This way users will know which day will be cheapest for them to take the flight. Also, Google Flight search is available not only for domestic flights but also for most international routes as well. 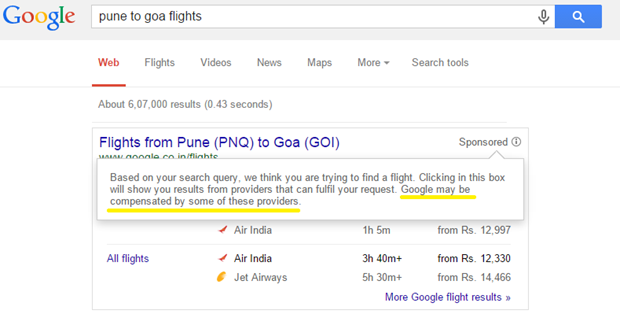 This is surely a bad news for Indian OTAs (Online Travel Agents) – a large part of their business does come from search queries on Google, and now most of those queries will be handled by Google Flight search. Also, given that Google Flight search is accessible and easy to use, many users will move from other OTAs to Google flights for the booking requirement. The future of Indian OTAs does not look too rosy as Google will keep pushing updates and new features and given that Google is default search engine for majority of Indian users, they would be more inclined to use Google search for their flight requirements rather than go to a some other site for their flight bookings!